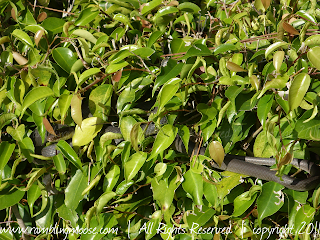 Yes, a Snake in the Hedge. I've heard of the whole "snake in the grass" thing before. It's an idiom in the US for someone who is sneaky or prone to doing things that are underhanded. Mind you, in the years living in New Jersey, Philadelphia and the "Philadelphia Suburbs", as well as all those trips I have taken through the Pine Barrens of South Jersey and hikes through Penn's Woods via the parks, I have only seen a small handful of snakes. I can think of three specific incidents, one rattlesnake and two garter snakes. Since I have moved to Florida, almost five years ago, I have matched that. One day I saw one laying in front of my front garden digesting it's dinner. By seeing it, it saw me and threw up it's dinner and ran away. Yes, I am the man who made a snake barf. The second one was inside the Florida Room inside the house. I opened the back door and it raced away. This one is the third snake. It was actually inside of a Ficus Benjamina Hedge around the block from my home. 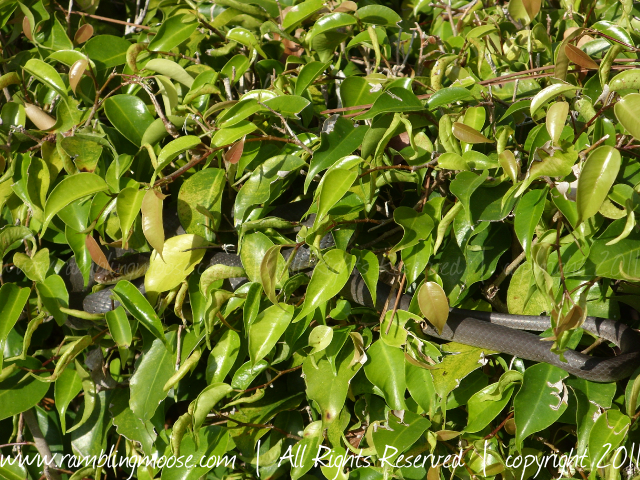 I was somewhat shocked thinking that snakes didn't readily climb trees, but here was this three foot long charcoal grey beauty sunning itself in the afternoon as if it owned the space. These are what I have been led to believe are Black Racers. They're known to be shy, more afraid of you than you of it. They may give you a nasty bite but are not venomous. On the other hand, I don't care to have them inside the house. I'm just glad I got it out before the dog saw it. She doesn't like "Critters" inside either and is more prone to do something about it. The reality is that I have seen quite a few of these snakes, so I am counting "encounters" instead of merely seeing them. Living in Florida means living in close proximity to wildlife. Some are what people jokingly call "Charismatic Megafauna" - things like Manatees and Dolphins that are big and friendly and people actually like. To have a healthy ecosystem, you have to make room for your friends as well as those who you'd prefer to keep a healthy distance from. In my case, like this snake. It's fine as long as it stays in that hedge. I'd prefer not to scare the dinner out of it either. Or have it scare the dinner out of me.